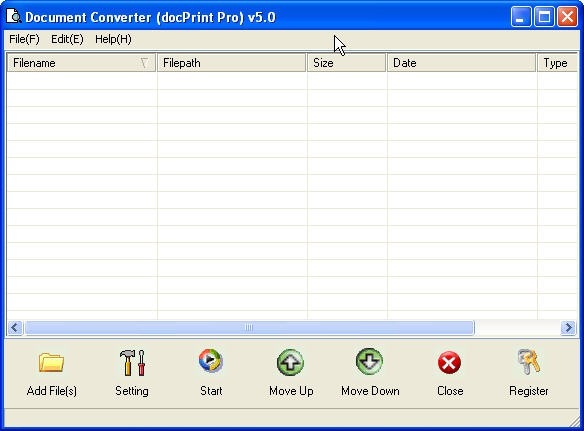 ← Dose PDFPrint support specific commands for dedicated printer? Here I will share you a way of converting htm to pdf by Document Converter which either can be used as a file format converter or a printer driver. When you use it as a printer driver, it can save a lot of ink, paper and precious time for you. When you use it as a converter, it nearly can convert all the printable files to image files or PDF files. As Document Converter is really powerful, I can not list all its functions here. In this article, I will take converting htm to pdf for example to show you how to use this software GUI version when you use it as a file format converter. First of all, get one copy of this software. When you download it successfully, there will be an icon on the desktop. Double click it then you will enter its interface which looks like the following picture. When you enter its interface, there are many blanks stated on the its interface. Just simply drag the files needed converting to the software interface, then the detail information will be displayed on the blanks. By this function, no matter how many files you have added to it, you will not mistake this one with another. Click the button “setting” then you will enter this software menu option which can be checked by the following picture. Its main menu tab is made up by five sub tabs. When you convert htm to pdf, the second tab named “Save image mode” can be ignored, because it is about the image file formats. Then you can browse them one by one. In the first tab named “Base setting”, you can set the output file format as PDF. 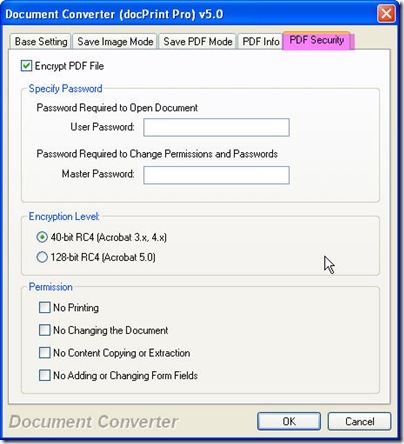 In the third tab, “Save PDF mode”, you can set where and how to keep the converted PDF files. In the forth, “PDF info”, you can add tile, subject, author and keywords for the converted PDF file. 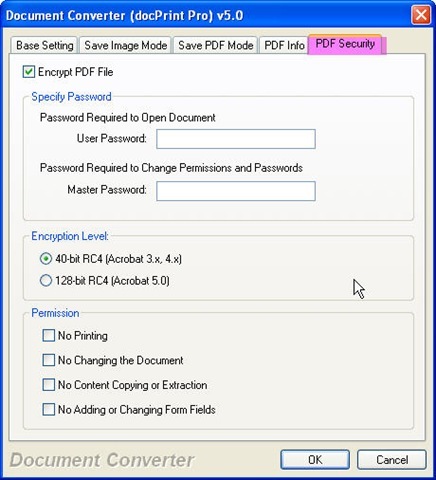 The last but not the least, it is “PDF Security” tab, in this tab; you can set passwords for the PDF files in two levels from two aspects. As to details, please see the following picture. Once you finish the conversion, you can back to its main interface by clicking the button “OK”. Click the button “Start”, then you can choose the output folder. Meanwhile, the conversion from htm to pdf will be run automatically. A few seconds later, you can check output files in the chosen folder. Here I will call an end for the conversion from htm to pdf. Thanks for your reading. How to convert documents of Microsoft Office Excel to JNG? This entry was posted in docPrint Pro and tagged htm to pdf. Bookmark the permalink.